In a large pot, bring juice, cranberries, sugar, nutmeg, cinnamon sticks and cloves to a boil. Reduce heat and simmer until all of the cranberries have popped. Remove from stove and pour mixture through a sieve lined with cheesecloth into another large pot. Reserve 20 or so of the burst cranberries and the cinnamon sticks. Allow mixture to cool to room temperature then add the grain alcohol. **CAUTION: Do not add alcohol near a flame or heat source. It is highly flammable. Make sure mixture is completely cooled before adding alcohol. 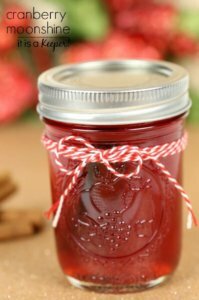 Add 2-3 burst cranberries and a cinnamon stick to each mason jar. Ladle moonshine into clean mason jars, leaving a 1/2 inch head.